Philips has showcased a range of new products and enhancements coming to their Hue smart lighting range at this year's IFA trade show. Among the changes come some interesting software additions, and expanded Apple HomeKit support. The product announcements are European focused, given the venue, but the other features will be worldwide through the Hue platform. Coinciding with the release of iOS11, the Hue accessories will gain HomeKit support. Specifically the Hue Tap switch, Hue Dimmer switch and the Hue Motion sensor will be getting integration with Apple's smart home platform. I've written about using the Hue Dimmer as a non-destructive replacement for your light switches previously, the obvious caveat to date has been that this use is limited to lights controlled by the Hue Hub, and you can only control the lighting at the room level, not by individual light. The new HomeKit support will allow you to trigger HomeKit scenes, and thus allow much more granular control, and control of other lighting products (among other accessories). You can mix and match other vendors offerings that don't connect via ZigBee such as the Koogeek LB1 and Aurora Nanoleaf (which use WiFi) and still control all your lighting through these switches. The addition of the Hue Motion sensor will also offer some practical options as the Philips sensor, unlike others on the market, includes ambient light detection. For the European market, a number of new lighting products have been announced, along with some new bundles. The new Philips Hue white ambience Light Recipe kit will offer a standalone implementation of a White ambience E27 bulb, and a Dimmer switch that can work together out of the box, without a hub. 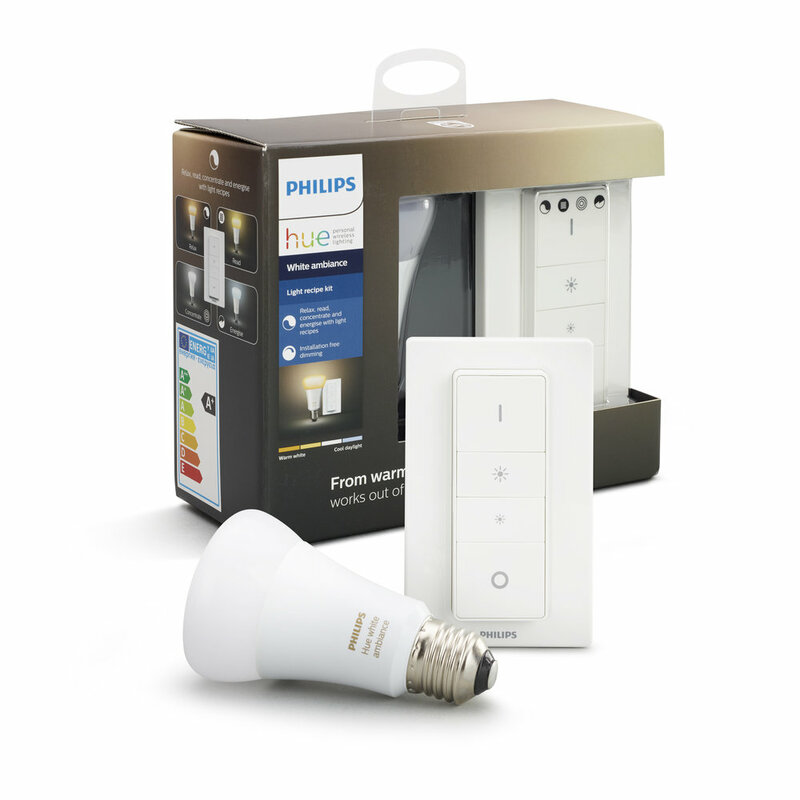 The Hub can be added later to expand the system, so this provides a low cost of entry starter kit for those interested in trying out smart lighting. The setup only offers the basic 4 Philips Hue presets (Relax, Read, Concentrate and Energize), but there is no configuration to do. The new E14 candle bulbs will be coming in 2 packs (both white and color models) from September, along with a number of new starter kit combinations. Four new light models are also set to be released. Two new white ambience spot models, the Buratto and Buckram, a new table lamp for the bedroom, the Felicity, and a new bathroom lamp, the Struana. The latter has an IP44 rating to make it better suited to humid environments, and comes in a unique low profile form factor to provide even light throughout the bathroom. All of these new models will include, in the European market, a pre-configured Dimmer switch as well. Philips has reaffirmed their commitment to ZigBee standards, advising that the Hue portfolio will be moving to the new ZigBee 3.0 starting in 2018. More interestingly though, is the announcement of a big media partnership in support of Philips Hue Entertainment. This new feature, coming via a software update in December, will enable interactive synchronization of your Hue lights to movies, games, and music content. This feature is a streaming-optimized interface that co-exists with the ZigBee protocol. It's intended to reduce the latency for lighting commands to enable fast state changes that support real-time special effects. Philips claims the interface can support state changes up to 25 times per second without creating network congestion. The Hue app will gain the ability for the user to define the spatial layout of their lights in the room, and Hue Entertainment takes care of determining the optimal effect rendering for that specific setup. A new API and SDK is coming for registered Hue developers, with use in the gaming world in mind. How this translates into real world use is not entirely clear, but the invitation for content partners suggests that the media providers will need to play a big part in making this work for any given content.